Reykjavik, for me, was a surprisingly dull city. Granted, I can’t party like I used to, so going out for the all night benders was out of the question (that and $10 pints are unappealing) I found the daytime city to be quite grey. Literally, since there was very little colour in the buildings and apparently people in Iceland decided to build their capital in the most overcast part of the country. Way to go! Posted on Wednesday, June 20th, 2007 at 12:00 am. 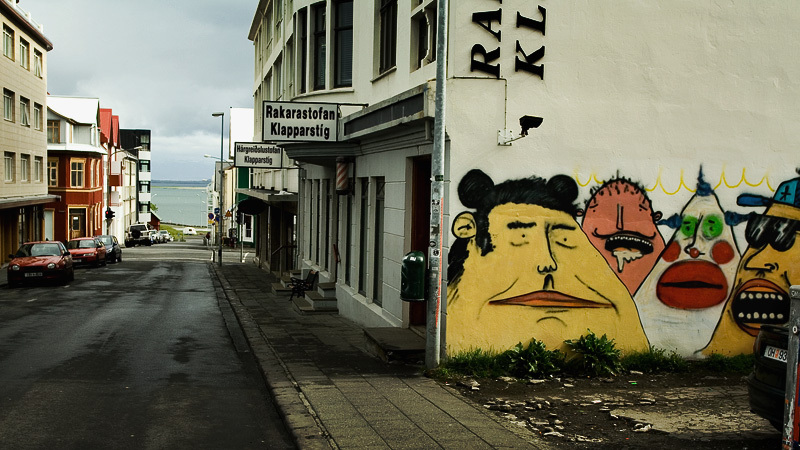 Filed under: Iceland Tags: Graffiti, Iceland, Reykjavik	RSS 2.0 feed. that's awesome graff art. it looks like that street smelled nice. Yeah, the art is great. I'm sorry that reykjavik istn't interesting at all. hope you had a good time there although. this picture at least looks pretty cool. This shot appeals to me. Like the gritty quality and the way you composed it. Street art! you know i love it. Great shot..makes me want to be there.